This post has been waiting to be finished since March of 2013. It began, as good ideas so often do, with a wonderful photo by Babs Young. Those are Belgian draft horses, bred for strength (and also, I’m inclined to think, character). Good horses have played an important role Around Here for at least 150 years. 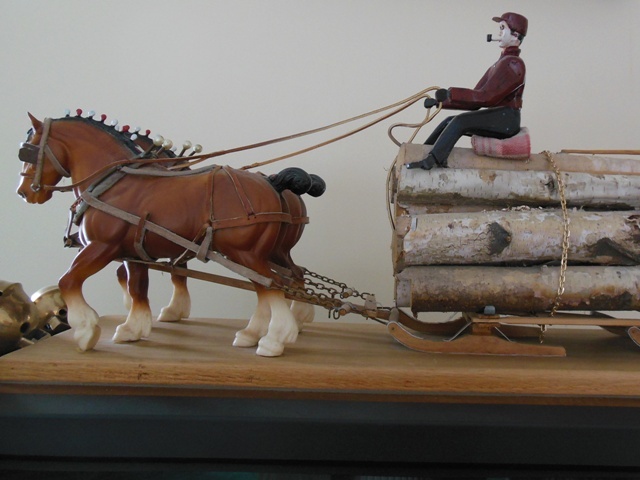 They drew the sleds piled high with logs to the banking grounds. They pulled the stumps to clear the land for planting. They brought the mail stages over the first rudimentary roads. 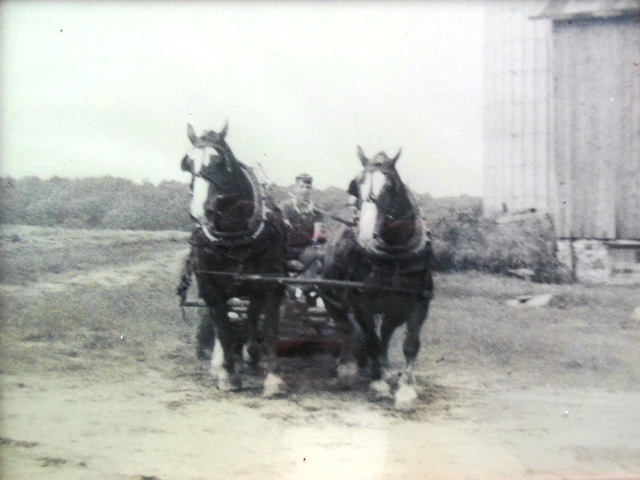 Every local history group in the North Country has a collection photos featuring excellent horses. What with John Deere and Henry Ford there isn’t so much call for a fine team these days. Nevertheless, there are still a lot of good horses in Antrim County. For some of us, a place without horses is pretty much . . . unthinkable. For as long as Hud Drenth can remember his grandfather, Floyd Black, had draft horses at the family farm in Charlevoix County. Here’s Hud at the reins of his grandpa’s team in 1968. What a thing it is to have that skill – and to be entrusted with such power and beauty. Hud dreamed of owning horses himself, but the farm went to others in the large family, as was proper, and the dream was laid aside. He grew up and married and built a good life. He likes history, and has saved a remarkable collection of vintage books and journals about agriculture. The Drenths have a nice piece of land, with a comfortable house and a fine barn. 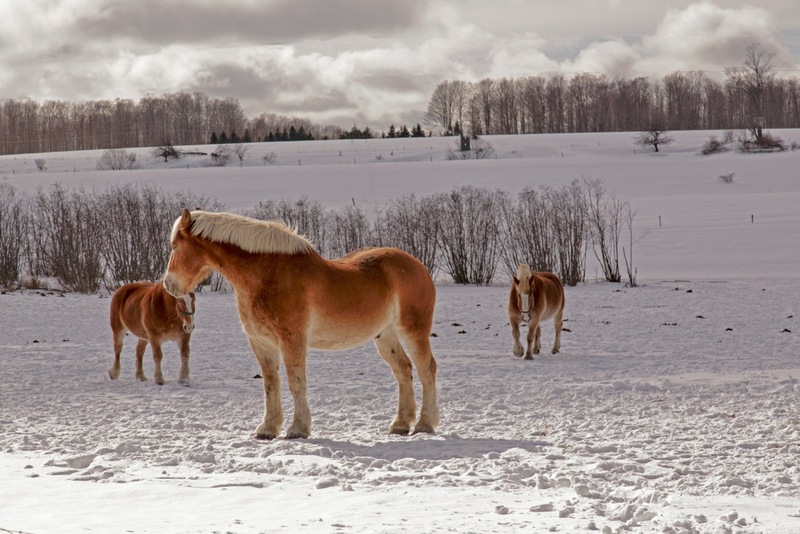 In the pasture, at last, are those Belgian draft horses. They win prizes at horse-pulling competitions, which are an impressive feature of many a fair. Hud wins prizes for horsemanship. The rest of us win because we get to have horses in the neighborhood. It’s a fine tradition. ← Happy First of Many Hogs – wait, wait . . . I think I should go to the next Michigan Horse-pulling Association event. I wonder if I might get Babs to come along. This is so much better than tractor pulls I can’t even say. The photo of the loggers with their horses is so fine. My mother told me that her grandfather had a team and used them to farm. Of course, I never knew him and there were no photos, so what Mom told me is the extent of my knowledge. Well, except that every time she talked about those horses, she smiled. In the last few years I’ve rummaged through quantities of 19th century photo collections. Generally speaking the people who come the closest to actually smiling are the ones with the horses: the teamsters in the logging camps or the farmers in the fields. Horses are good company. “This is so much better than tractor pulls…” Got me laughing, Shoreacres! A lovely story, beautifully told. I like the last two sentences as I to would be happy to see horses like that in a field near me. There are indeed horses Around Here, but mostly they are ponies that youngsters ride at the weekends. That’s very pretty but I’m sure those fields were once used for food not leisure. Thank you, Joss. The horses I see on my rounds always delight me. As a child on my grandparents’ farm I saw lots of cows at neighbor Gunde Larson’s place, and lots of chickens (and blasted geese) at ours – but alas, no horses. We were a thoroughly modern farm, with a tractor, a portable sawmill rig, and Grampa’s Cruck – a Ford of uncertain vintage, but certainly Pre-War. What a wonderful story! Thank you so much for writing in your unique way of such interesting people and places! I remember seeing some big draft horses pulling logs on West Torch Lake Drive probably 10 years ago while riding our bikes. They were so beautiful we had to stop and watch for awhile. I wish I had a couple to pull us out of the 20 inches of snow we had in the last day here in East Lansing! Thanks for your tales Gerry! OK, I am officially persuaded that my leg is being pulled. 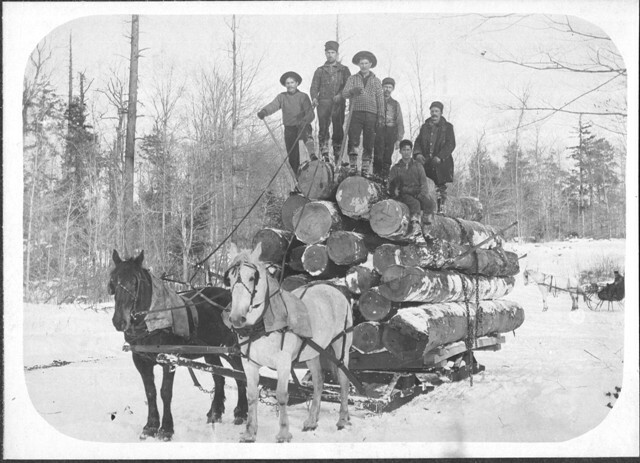 It’s hard to tell for sure, what with the snowpants and tall boots I’m wearing as I type this with my mittens on, but I am skeptical that draft horses hauled a load of logs along West Torch Lake Drive ever, let alone in the 21st century. I would be fascinated to be proved wrong, of course, and would promptly go interview the teamster and post updates. They are indeed. Those are the kinds of horses who would have been very at home Around Here back in the day. I was NOT kidding about the horses on West Torch – they were in a cleared area almost to the end and they were definitely alive and pulling something. I can’t believe we were the only ones to see them. Seriously? I must ask around. Wait, wait – would this have been along the piece of WTL Drive at the very southern tip of Torch Lake? The piece that was (and may be still) dirt road back then? Because that would make a certain amount of sense. I’ll go see. OK, not today – there’s too much snow and my car won’t start anyway. Battery died of the cold. But soon. I’ll bet there’s someone down there north of Hickin Road who keeps draft horses for competition. Back later. Beautiful picture, beautiful horses. I’m partial to Clydes myself, but these are eyecatchers. With nothing to give scale in the picture, I first mistook them for those Norwegian Fjord horses. Belgians I’m used to seeing are uniformly butterscotch colored. I’m glad Hud got his dream team. Horses should only and always belong to those who treasure them. I’m very fond of what I’ve always known as “Clydesdales” (particularly the Budweiser Clydesdale team). Would these be the same as Clydes? The Belgians are quite large. If I stood beside the one in the foreground, I think my head would be below his nose. You’re quite right about where horses belong. They can be an overwhelming responsibility even for those who treasure them. OK Gerry, I am not sure where Hickin Road is, but we were not on a dirt road when biking. It was on WTL drive in the section from Barnes south. There was (and may still be) a small cleared area on the west side of the road (non water side) and there were two big horses pulling a cart with some logs on it. It was not seen again, so maybe someone was visiting but I am not sure. My husband insists they were pulling logs (not on the road though) and I agree. If it was just me I might think I was having a dream, but we both definitely remember this. Hope you find out something, but I will ask around too whenever we get back up there. Curiouser and curiouser. I will ask Wendi and Terry Wooten. I’ll bet they know. And then we will have another story to add to this one. Lovely story and photos (good ol’ Babs).